Having a pool deck around the pool enhances the beauty and adds to the convenience of having your own pool. It helps to maintain your pool area better by making dirt and debris harder to track over the area and inside the pool itself. Build a pool deck is easier than it sounds at first. The height is already determined by how high your pool is. The shape is also determined for you. Your pool deck will outline the shape of the pool. 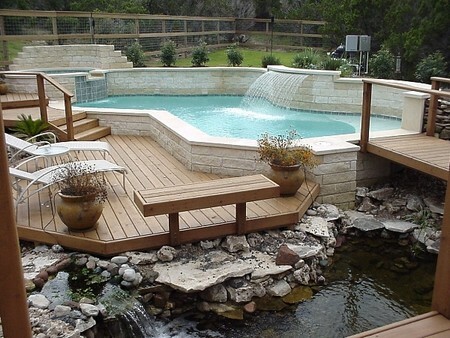 Here is how you can build a pool deck. Choose where your stairs will sit on the ground. This will be the starting point of your pool deck. Purchase pre made stringers for the stairs. You can even measure the height of your pool to help. 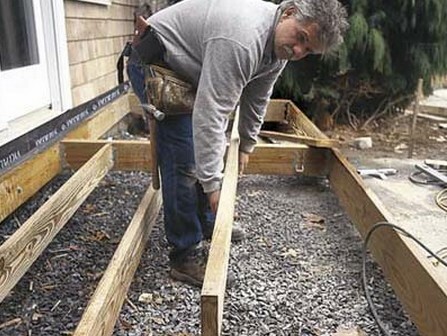 Construct the under framing of your deck. Use pressure treated lumber to do this step. Build your frame a little lower than the actual height of your pool. You will have to use extra because of how thick the boards are. Sink 4 x 4 inch posts a minimum of 2 feet into the area around the pool. These are the supports. Make a cross brace out of 2 x 4 inch posts placed in an ‘x’. Attach them with the lad screws and bolts. Use 2 x 6 inch boards to joist the deck boards around the outside of the pool. Secure 2 x 2 or 2 x 4 uprights as posting for the rail of the stairs. Also use them for the main deck area that will be situated around the pool itself. Attach the deck boards to the stair runners and to the front side of the risers. You’ll need to use stainless steel or coated screws. They need to be long enough to penetrate the deck boards and into the staircase. Secure the decking to the 2 x 6 joists. Cut the decking to the same shape as the pool. Place the top post to the rails. Now, put on the rail pickets .They should not be spaced more than 3 inches apart. When the deck is finished decide if you will enclose the bottom of the deck or leave it. If you want to close your new deck you may use options like pre made fencing panels that can be customized to fit the shape, height and size of your pool.